← An Author/ Illustrator blog hop with give away. Some may think I should put up a special Thanksgiving book since this is the last time before Thanksgiving we will do a Perfect Picture Book Friday selection. But really this book exemplifies many of the things I am grateful for this year. Love of books and library fun, the special places books bring me and the special programs libraries give, and a little girl who knows all that and has to fight humiliations to get there, is all it for me. We have come far since segregation but still have so far to go. Racism is still a battle we are fighting. Here is my special pick for today. Grab your coffee and have fun. Themes: Afro-American, Segregation, Love of reading, Self Respect. Summary: In segregated 1950’s Nashville, a young African-American girl braves a series of indignities and obstacles to get to one of the few integrated places in town, the public library. What the jacket says: “There’s a place in this 1950’s southern town where all are welcome, no matter what their skin color… and ‘Tricia Ann knows exactly how to get there. To her, it’s someplace special and she’s bursting to go by herself. When her grandmother sees that she’s ready to take such a big step, ‘Tricia Ann hurries to catch the bus heading downtown. But unlike the white passengers, she must sit in the back behind the Jim Crow sign and wonder why life’s so unfair. Why I love the book: Like all of Jerry Pinkney’s work the rich watercolor illustrations are a real addition to this manuscript. His art makes each page a delight to look at and read. The story is special because of where it leads, the public library. ‘Tricia Ann is a special child in that she goes on despite the hurtful signs and comments finding solace in her grandmother’s voice in her head and heart. 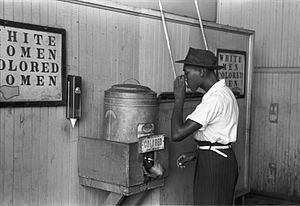 There is back matter explaining that Afro-American children usually weren’t allowed out of their own communities until elders were sure they could with stand the Jim Crow laws. Here are my gifts for my writer friends. From Cynsations: should picture book writers always find resolutions and bullies always get their best deserts. And for my readers who journal, here is another great post by Write to Done. And journaling exercises to bring you closer to your story in your manuscript or your story in memoir. Great post. For more links to Perfect Picture Books, a collection of bloggers who contribute at Susanna Leonard Hill’s site, click here. There will not be a PPBF next week since it is the day after Thanksgiving and we all need time to digest turkey. See you on Tuesday though and find out who the winners of the give aways are. This entry was posted in blogging, Clara Bowman-Jahn, Clarike Bowman-Jahn, Course or Book Review, Perfect Picture Book Friday, social networking and tagged Common Core Standards, Coretta Scott King, Goin' Someplace Special, Jerry Pinkney, Perfect Picture Book Friday, Susanna Leonard Hill. Bookmark the permalink. That sure is a lovely smile considering all the troubles, nice! I like that first tip very much and will now ask myself if things need to be solved. Thanks, Clar! Thanks so much, Catherine. it’s so true isn’t it? This is another wonderful book, good choice for Thanksgiving week! I have long admired McKissack and Pinkney! That’s a winning combination in this book for sure! And the library! A special place indeed! I’ll be checking this one out. Thanks for sharing! We have this book in our colllection and pick it up all the time. It never gets old. Great choice! Looks like a tough subject is tackled perfectly here. You always pick good books on sensitive topics, Clar, and this is no exception. I, too, enjoy Pickney’s illustrations! Absolutely one of my all time favorite books! Thanks for highlighting it, Clar! Great selection. Two segregation books already today — I almost ran one. This sounds like a story that is handled with great sensitivity by the author. Love your introduction, Clar. This is a winning author/illustrator team! Wonderful book for the Thanksgiving season or any time, Clar! I just read Erik’s post…also about segregation…great minds think alike! I hope you and your family have a beautiful Thanksgiving! We are going to my brothers house tomorrow to share TG with him and his family. My boys are MIA. One is too far away and the other is moving. The actual day will be quiet. 🙂 How about you? Will you be busy eating? You will be busy then. Enjoy your family, Vivian. I may bring sandwiches to my son who is moving. Depends on what he wants. It’s an hour away in DC. It would be fun to see his new house and help him celebrate the holiday. we’ll see. Too true! So grateful for beautiful books that deal with subjects like this. Can’t have enough of them! This is an awesome read. It should be in every school library!! I already have a review of it on my Book Reviews (kids to YA) on Pinterest.